Home » Posts Tagged "Engineers Without Borders"
The members of the Engineers Without Borders at Penn State Alternative Spring Break Trip to Spartanburg, SC, (from left to right): Brianna Basile, Jonathan Caballero, Anthony Palacin, Jaden Martz, Karli Drda, Karen Bobkowski, Jessica Slavejkov, Allison Webster, Rachel Kester, Dayse Tapia, and Mouneesh Badam. When I originally signed up to go on the Alternative Spring Break trip for Engineers Without Borders at Penn State, I had some doubts. For one, I didn’t know many people who were going on the trip. Plus, I wasn’t sure if I was okay with not going home for the week. My reservations vanished when I met the people on the trip and we hit the road. Everyone was very friendly and excited to get started on our projects. After a ten-hour car trip, we arrived in Spartanburg, SC, to sunshine and 75 degree weather. We spent the first night settling into our home for the week, Saint John’s Lutheran Church’s Youth Center, and getting to know Sharon Tarver from the Fuller Center for Housing, who organized the projects that we had for the week. The first project was to help a family of five whose house had fallen into disrepair after a leak developed in the roof next to the chimney. We were tasked with removing two trees that had been in danger of falling on the house, chopping it into firewood for the family’s wood stove. 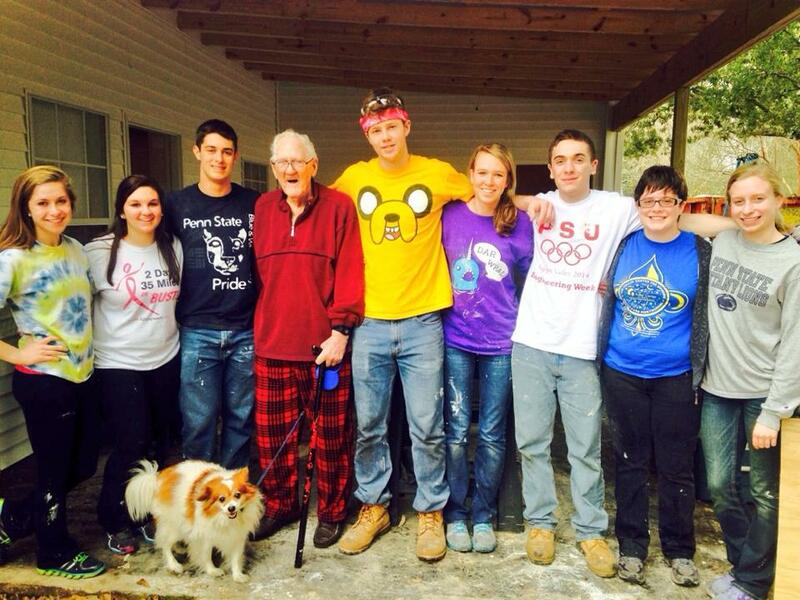 The rest of our time in Spartanburg was spent working on a house owned by a gentleman named Earl, an elderly veteran. Earl was unable to take care of his home after he became disabled. Extensive damage made the bathroom unusable and forced Earl to move to a nursing home. We spent our time in Earl’s home repairing the bathroom, including replacing the tub, sink and toilet and strengthening the floor supports and replacing sheetrock. Since Earl had been away for some time, the rest of his house needed cleaning to make it fit for him to live in again. The kitchen sink was replaced, and Earl’s book and computer collection was organized and dusted. After his home was back in working order, Sharon sent a few members of our group to visit Earl to give him the good news. Meeting Earl was a very inspiring experience. He was overjoyed when we told him that he would be able to move back home soon. After living in the nursing home for some time, he was excited that he would be able to return to the home that he had lived in for more than twenty years. He could not thank us enough for what we were doing to help him. Earl himself was able to add to the good news: after becoming disabled and having a stroke, he had been confined to a wheelchair. However, in the few months prior to our visit his condition had improved drastically and he was once again able to walk. He also told us stories about his wife and about being a veteran. Hearing these stories made us all see how we were helping to change Earl’s life for the better. As the week drew to a close, we said goodbye to our wonderful host Sharon and the others who helped us with the projects, and headed back to State College. Although the trip flew by, I’m sure none of us will forget the awesome memories we shared. Karli Drda is a sophomore studying Earth Sciences in the College of Earth & Mineral Science. 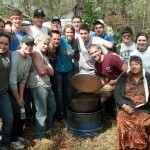 This is her first year in Engineers Without Borders at Penn State. She hopes to continue being an active participant in the organization, as well as other community service groups, for the remainder of her time at Penn State. She hopes that her experiences in Engineers Without Borders will help with her future career in Earth Science. EWB volunteers gather on the last day of work to say goodbye to JoAnn and celebrate the fantastic progress made on her home. Where to begin, where to begin. 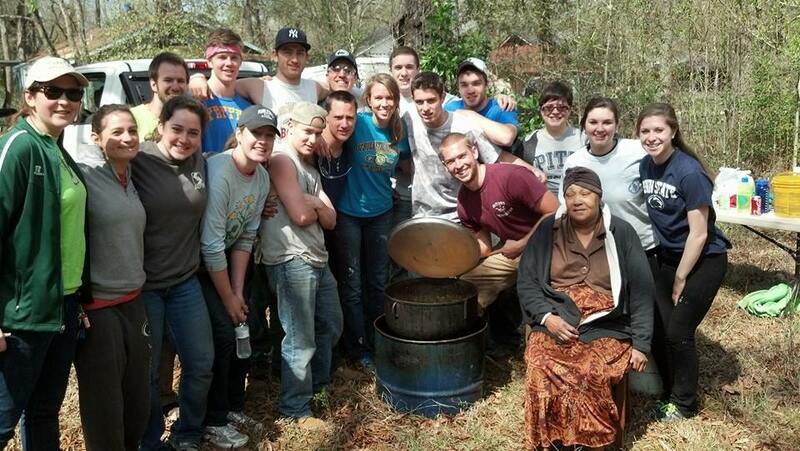 Let’s start at the beginning: A van full of Penn Staters on a alternative spring break trip to Louisiana for Engineers Without Borders. A nineteen hour car ride halfway across the country. After a bathroom break in Tennessee, the van doesn’t turn back on. OK. We made friends – and created an unrehearsed video to Harlem Shake – while waiting for AAA only to learn that we had a weak battery. There was no time to replace the battery so we continued our trek to the sunshine and the legendary cuisine of Louisiana with only a 50% chance our van would turn back on. Needless to say it was quite an exhilarating experience every time we filled up for gas. Somehow the odds were in our favor and we were about to make it to our home for the week, Rosaryville Spirit Life Center, a spiritual retreat and convent with beautiful grounds surrounding their chapel and clubhouse, in Ponchatoula, LA. Despite our collective average of one hour of sleep, the first day was a blur as we readied ourselves to get our hands dirty by buying our supplies and repairing the van. We met with our Tamara Danel, our contact from the Fuller Center for Housing, who described the projects that needed the most attention for the week. As we pulled up to our first site that Monday, it was evident we would have our hands full. 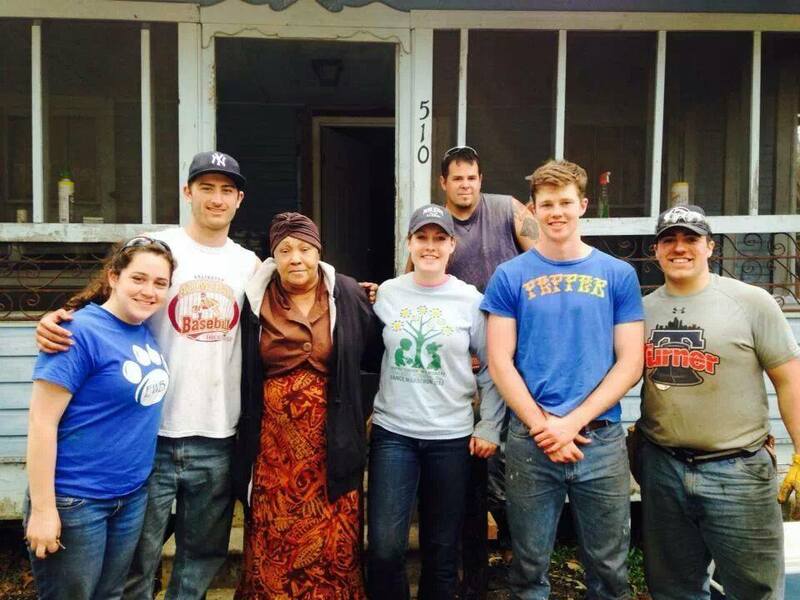 We were to assist an elderly, handicapped woman named JoAnn in salvaging her home of nearly fifty years. There were some significant repairs that needed to be made, but the most obvious one was the demolition of the back half of her home that had collapsed in on itself and was leaving the interior of her bedroom and living space exposed to the elements. In addition, the vast majority of her roof was shingle-less and rotting out and we knew replacing her rafters would be no easy task. The entire Penn State EWB group enjoys a delicious, donated meal of casaba pastaya with their client JoAnn and the Fuller Center staff. Just simply being there with her it was palpable how deeply grateful she was as she broke down into tears and prayer and insisted on hugging each of us. Tamara had told us how JoAnn lives in constant fear of snakes entering her home as a result of her property being flooded because of faulty plumbing. There was an incredible work to be done and our volunteers put their hearts and backs into the job right from the beginning. In addition to working with JoAnn, we also had the pleasure of helping George, a WWII veteran. 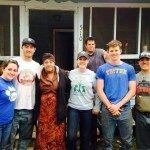 George’s situation was unique because various community organizations had been doing repairs to his home for roughly a year and it was clear immense progress had already been made. When they first visited the 91-year-old man’s home there were massive holes in the roof and he was sitting in his living room surrounded by buckets to catch the water that came through the holes. As a result, George’s home had been invaded by various insects and reptiles. When we arrived George’s living room had been converted into a covered porch and his roof had been replaced with metal shingles. The Engineers Without Borders team’s main focus: finishing interior renovations such as stripping out old carpets and drywall, laying new flooring, putting up new drywall, and painting the home, inside and out. 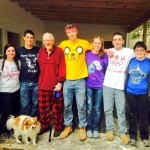 Penn State EWB Alternative Spring Breakers take a break from working on the interior of the home of their client, George (shown third from left). It became clear to us that buildings in Louisiana are in constant battle with the wet and volatile climate, and George’s home was no exception. His gratitude was clear to us. Each morning we were there he would wake up early to come spend time on his new porch, sharing with us his life experiences and carpentry knowledge. He even brought out his collection of war medals and exclaimed each time that he had received them because “the president had thought he was a good boy back then.” It turned out that he had actually been a runner up for being on the crew that dropped the hydrogen bombs that ended WWII and it was clearly something that was very dear to him. By the end of the week we had had a week chalk full of all kinds of experiences. We had made incredible progress on both sites, with JoAnn’s home completely sealed and half her roof replaced with metal shingling, and George’s interior gutted, replaced and painted. We had each eaten what seemed to be a lifetime supply of seafood. We got to dwell in the vibrancy and excitement of New Orleans, and even meet the original cast of Swamp People at their four-generation old alligator and turtle farm. To say it was a memorable week would be an understatement. Nick Slavtcheff is majoring in chemical engineering and minoring in entrepreneurship and plans to graduate in May 2016. He’s been part of Engineers Without Borders (EWB) since his freshman year and served as the Alternative Spring Break Coordinator this year after going on the trip in 2013. He says he has always had a passion for humanitarian work and found EWB to be an incredible avenue to pursue that passion. He hopes to be an EWB officer again next year. Originally from Guilford, CT, Nick’s family now calls Washington Crossing, PA, home. 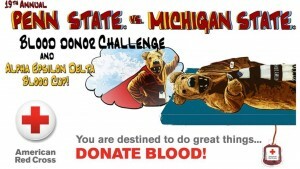 Four engineering student groups are doing their part for the annual Penn State vs. Michigan State Blood Donor Challenge. 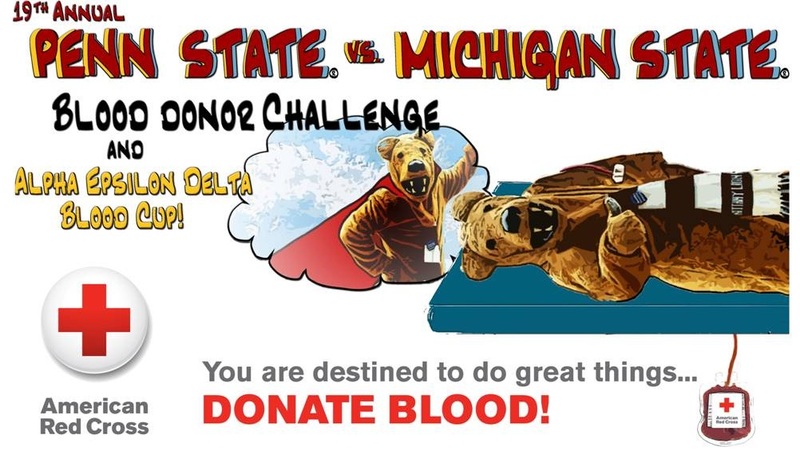 Kunkle Lounge will host a blood drive from 10 a.m. to 4 p.m. on Nov. 2. Donors will receive a challenge T-shirt, pizza and coupon package from area businesses. To schedule an appointment, donors can go to www.psuredcross.org. The event is sponsored by the American Society of Mechanical Engineers, Engineers Without Borders, Society of Women Engineers and Engineering Graduate Student Council.